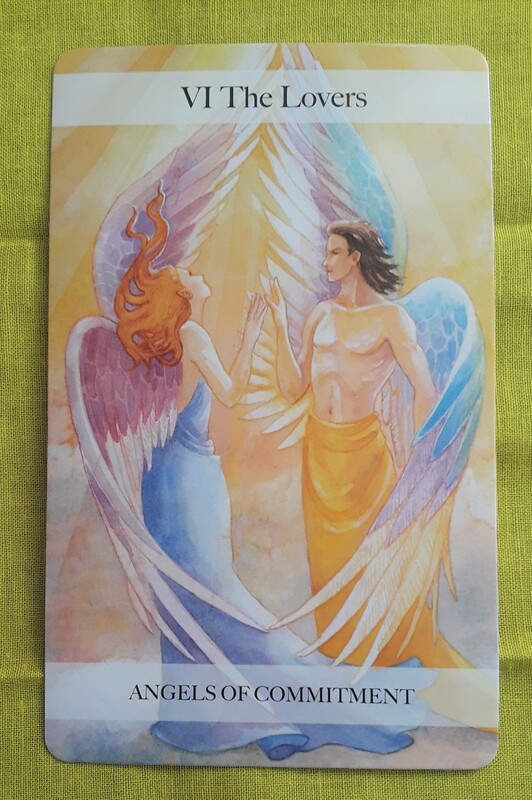 The Tarot card of the day is the Lovers (Angels of Commitment). Today is the full moon! Celebrate all that you have accomplished through the spiritual work you have done over recent years, months, weeks, and days. Use the lessons learned to help you decide what you need to let go of that doesn’t serve your highest good. Make a commitment to love yourself, to accept yourself unconditionally, and to be authentic to your true self. Hi, all! The Tarot cards for today are the Lovers and the Hermit. That is certainly an interesting combination to show up, considering the Lovers puts the spotlight on a relationship and the Hermit generally relates to being on your own. If you are into astrology, you may know that we are in the shadow period of the Venus retrograde coming up on October 5 — meaning that romantic situations you are going through now will be revisited during the retrograde. The Lovers card is asking us to take a deep look at our love partnerships. What are the foundations of your relationship? What do each of you bring to the table and what is the higher purpose of your union? 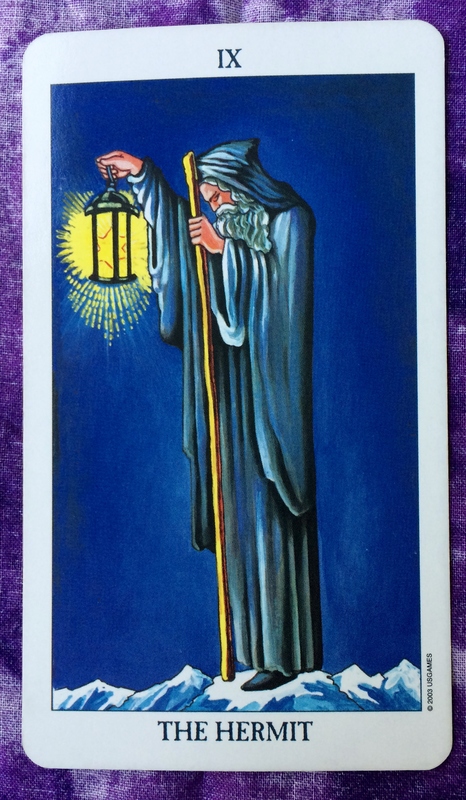 At the same time, the Hermit card is asking you to make sure that you are a complete, self-actualized person. Don’t expect the relationship to save or cure you. Come to the relationship whole and expect your partner to be a whole person, as well. In a perfect world, two separate and authentic individuals come together in a relationship to create something greater than themselves. Hi, everybody! The Tarot card for today is the Lovers. This could signal that fated relationships are going to play an important role today and throughout the week. This could involve a romantic partnership, or it could have to do with family relationships and non-romantic friendships. Whatever the case may be in your life, the goal is to make sure that you are being authentic and not just going through the motions. At the same time, expect the other person to give you the same honesty and commitment. Don’t be shy and don’t leave it to chance. Speak up. Spend the time. Do what has to be done so that you are all on the same page — body. mind. spirit, and soul. The card for today, Saturday, and Sunday is the Lovers. Your commitment and integrity within relationships are highlighted here. The goal is to achieve true authenticity and intimacy. Don’t just go through the motions. Whether it is your family, friend, or lover, understand your connection to that person and live it. At the same time, don’t hang on to relationships that are no good for either of you. Your relationship to yourself, meaning the person you are without the labels — the essence of your heart, soul, and mind. So the message for today is to act with integrity and honor your commitment to others, your higher purpose, and yourself. Don’t be ashamed of who you are and what you have to accomplish in life This is the foundation of self love, and self love is the foundation of strong bonds of all kinds. What new direction do you want to go in life? Does it involve moving to a new location or changing jobs? How do you fine-tune your relationships with others? Is is better to cut off some relationships or perhaps to reset boundaries? What health and lifestyle changes do you need to make in order to feel better? Whatever your situation is, the decision that matches your true heart’s desire is the one that will give you the most reward. The Lovers card is a reminder that any other choice will eventually leave you lost. Unfortunately, the right choice is not always the easy choice. What is that nagging voice warning you against being your authentic self? It’s your own fears keeping you stuck and trying to protect you from failure or rejection. Though it’s easier said than done, push through any barriers. It will be well worth the effort. You are not seeing double: The card of the day is the Lovers once again. This is not a bad thing because the energy of this card is super positive. The Lovers is a Major Arcana card, and like all Major Arcana cards, it has a far reaching significance when it shows up in a reading. Therefore, really sink into yesterday’s message as it applies to your life. Really appreciate how it feels to be your true self in relationships, despite the temptation to do otherwise. When you show up fully in your dealings with others, they are inspired to mirror you back by showing the best of themselves, and the Universe will ultimately support you both by bestowing abundance and expansion. So bear with me as I tell you a little story. When I read do a reading, I try to become a clear channel for whatever message wants to come through from the Universe. 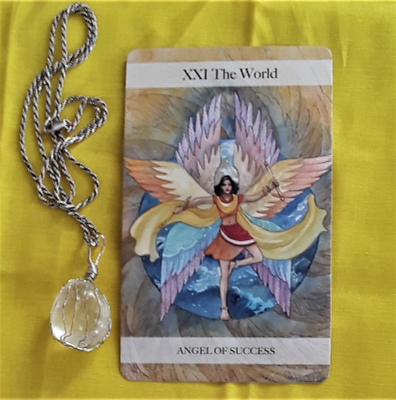 And ever since I started this series of blog posts, the card of the day has popped out of the deck while I’m shuffling. But it is important to me to keep it real, be who I say I am, and strive to be what I want to be, no matter who knows it or sees it. You can trust that I will do that. I have decided that I am all in. Today’s card, the Lovers, highlights the fact that we are all connected to each other and each of us is connected to the guiding force of the Universe. To keep the connection strong, we have a responsibility to uphold our end of the deal—which is to live out loud from our hearts, be true to who we are, and to love. Today’s message flows very nicely from yesterday’s message, which suggested that we act on our passions. Understand that the Lovers card is not just about the relationship you have with one particular person. It’s about how your relate to every person you come in contact with. You owe it to everyone you meet—and to yourself—to be authentic and real. The Universe is supportive of that. In fact, the love you give yourself is most important of all. And the best way to love yourself is to have integrity and stand in your own truth. Believe in yourself and don’t let distractions take you off your path. In light of world events, today’s message is especially appropriate. Many of us are profoundly affected by the unrelenting violence all around us, whether it be from war, threats of war, and terrorism—domestic or otherwise. At our lowest moments, it may seem that it is beyond our scope as individuals to create change. 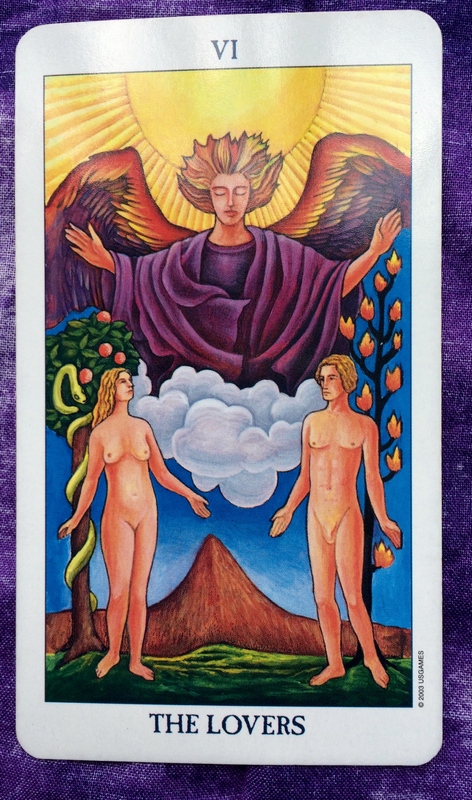 However, take a good look at the Lovers card, particularly at the deep blue sky and the radiant light above it shining down from the Universe. We—all of us—help generate that light with the power of our precious love.